In course of its development, PW had targeted the state power in its centre. The main objective of PW was to make the people owner of the state power by crumbling the thousand year old centralized state power of feudalist and the comprador capitalists down. The people; woke up by the initiation of PW and inspired and encouraged by the continuation of the PW, actively participated in war and due to the historic incessant struggle, they became able to dissolved the local power of reaction. They defeated local tyrants, feudal lords, landlords and the usurers. In course of military resistance, People’s Liberation Army was formed and organized. People’s justice system was built and the People’s economic-cultural systems were begun simultaneously. The combination of education, health and development-construction began and thousands of revolutionary whole-timer cadres were developed. Along with the victorious process of PW, Nepalese people for the first time got glorious opportunity to be the owner of the People’s Power from local to base-area level. They got freedom from local tyrants, feudal-lords, landlords and the puppets and the usurers. Women, dalit, nationalities and the repressed castes and the regions got freedom from hundreds of years old exploitation and repression. As the king took step of coup over the parliament in 2005, the parliamentary parties involved in the united front formed by UCPN- Maoist and only after the formation of the front the whole country advanced ahead towards the Constituent Assembly and Republic of Nepal according to the proposal proposed by the then CPN-Maoist in the period of People’s War. Under the leadership of PW and in the help of People’s Movement-II, the election of the CA was successfully completed and the then CPN-Maoist (UCPN-Maoist) became victorious as the largest party in the CA. Then, Republic of Nepal was declared. It was a political revolution, which had been possible due to the PW. On the basis of the total sum, we can say that PW is the victorious war. In the election of CA, the anti-people class; which was already defeated in PW, was defeated again shamelessly in the election of CA, the peaceful ideological struggle. The feudal lords, puppets, comprador capitalists and their representative parliamentary forces; which considered people nothing, were destroyed and smashed into the dust through the mandate given by the people. Nepalese people justified that the people are the history makers in practice. It was historically justified that all the illusions and the arrogances of the reactionaries could be made dust. However; misfortune! The defeated class is still in central power and it is pretending as if it is the owner of the state power. PW has been postponed while implementing the joint-tactics of republic (with parliamentary parties). At this time, some of the achievements have been shadowed or dissolved to create base for the agreement and co-work with parliamentary parties. People’s Power has been dissolved, People’s Liberation Army has been confined into cantonments and People’s justice system has been postponed. Communes, co-operatives, Hospitals, educational institutes, industries have been unsecured. Thousands of whole-timer cadres are spending their miserable lives. The complexities of transition are being increased even in the victorious revolution. Power sharing in the state power has transitional character in itself. The Nepalese people had expected that UCPN-Maoist and parliamentary parties would send their representatives in the bodies of the state power like administration, law, judiciary, diplomatic, economic, security and the given tasks would be conducted competitively in favour of people. The agreement was held on this understanding. However, the parliamentary parties have been unsteady and they are acting dishonestly. At the moment, UCPN-Maoist has no representatives in any of the bodies of the state power. The presence of the representative of Maoist is like zero in administration, judiciary, economic and diplomatic sectors. All these sectors are filled with the representatives of parliamentary parties. This shows that the agreement has been breached, people’s expectation has been scorned and the rights of Maoist and the people have been encroached. On the other hand, the possibilities of the public services have been ended. This clearly shows the stronghold of counter-revolutionary tendency in the state power. In essence, feudal and comprador class is counter-revolutionary class. This class has not been committed in forward going people’s republican agreements yet; rather it was compelled to accept agreement and transition due to the fear of the defeat of its own class. Therefore, it is making its best efforts to transfer revolution into counter revolution. It dismisses all the agreements in the help of state power and goes against the people openly. The defeated feudal and comprador capitalists, along with its puppets, its representatives and extreme parliamentary elements are in power and exercising the counter-revolutionary activities. These elements are making their efforts to make administration oppressive than to be public. They are trying to change the judiciary into patronages of the criminals and defeat the people instead of serving them. They are changing police administration into oppressive mechanism of the state power than making it public service mechanism. The economy of the country is made to be oriented to serve comprador and usurers than making it people-oriented. The struggles of the people against these have been taken as protest and the violence of the law and the whole state mechanism is being made prepared to deploy against the peaceful protest of the people. All these characteristics clearly show that the Nepalese revolution is incomplete but victorious. It is victorious incomplete revolution. Revolutionary class does not fight only against ruling power; rather it fights against the whole exploiting class which exploits the workers and labourious class inhumanely. Proletarian class does not struggle for the change of the rulers, another instead of one or a group against another; however, it fights for the establishment of proletarian class as the owner of the state power by kicking out the exploiting class. The truth has been explained in reference to French State Revolution by Karl Max and the expression is equally appropriate till now as it was before. Clarifying the struggle handled and run by communards of France, Max had said that the objective of the revolution was not only to remove the Monarchy but its aim was to establish and develop the proletarian state power by over-turning the bourgeois class state power. In the present context of Nepal, some of the elements; which are more or less influenced by the parliamentary ideology are trying to make the Nepalese people and revolutionary to harass by arguing that the suitability of the revolution accelerating ahead is not more important due to the end of monarchy. This parliamentary logic has no relationship in the present context of Nepalese revolution and its revolutionary objectives. Moreover, its ‘argument’ has no relation with Maoist people’s revolt. The objective and its relation were to end the exploiting class, not only the monarchy, and make the people owner and ruler of the country. Even today, the revolutionaries should grasp this truth. The objective of revolutions or peoples new democratic revolution in the context of Nepal is to make people ruler. However, it may take its way through fragments one after another. The revolution may be completed by defeating one power in a certain period and another in other certain period. This truth has similarity even in our Nepalese political context; which was explained in an excellent way by Lenin in his work in reference to February Revolution and October Revolution. Lenin clearly explains that Russian Socialist Revolution was completed in two phases due to the socio-political situation of the nation existed at that time. After first phase February revolution, bourgeois became the owner of the state power by eliminating monarchy and proletarian class could not be the owner at that time. As the Russian bourgeois class also maintained its state power against the people and the problems of the people remained not only same as they were before and became worse; the 2nd phase revolution became compulsory for them and, as a result, the proletarian class became the owner of the state power in place of bourgeois after final victory. It is equally true in our nation too. The monarchy of the Nepal was ended because of the strength and the strong organization of proletarian class and it was ended along with the declaration of federal republic. However, this phase of revolution was unable to make the proletariat owner of the state power. Here in Nepal, the place of monarchy has been taken by bourgeois class. The condition of the nation is going to be ruined more and more. The bourgeois rulers have applied oppressive method of reign. The sector of the people’s livelihood is perplexed. National sovereignty has been weakened. Therefore, the people are reaching near to the conclusion that new people’s democratic revolution under the leadership of proletarian class is inevitable in the country. This has paved the way with its reliable strong foundation towards the second phase of Nepalese revolution. The revolution will fulfill the expectation and aspiration of the people for change. Proletarian class always struggles; however, these struggles are not similar with that which is done in some certain period. Generally, the struggles are different than similar. We should take them differently according to time and space. The struggle should be of special quality which is done in a special situation that is in favour of revolution. That type of struggle can change the revolutionary possibilities into reality. The proletarian class has sacrificed for smaller or bigger struggles and the sacrifice has special importance in some extent. The alliance of feudal and comprador class has become more oppressive that was established after the end of monarchy. This class is not in the condition to solve the problems of the nation and its people. This situation (crisis in exploiting class) should not be taken as a simple thing by the revolutionary and proletarian class. It needs a special type of struggle for change. As we adapt the version of Mao, we should take it as the struggle to ensure victory of the people. 1. Build united front of all the nationalist, republican, leftist and progressive forces under the leadership of proletarian class. 2. Consolidate the unity of exploited class, nationalities, region and gender. 3. Write people’s constitution according to the mandate of the people. 4. Conduct the struggle against the anti-people and anti- nation activities of parliamentary parties like Nepali Congress, UML etc and take initiative to form the government under the leadership of UCPN-Maoist according to people’s mandate. 5. Handle the struggle of national independency against the intervention of foreign powers, especially Indian Expansionism. 6. Build a New Army by fusing both the armies (People’s Liberation Army and Nepal Army) on the basis of equal status. 7. Implement the power allocating principle in the mechanisms of administration, judiciary, security, diplomatic, economic and others. 8. Handle struggle to use the black money earned by corrupts and smugglers in favour of people and the nation. 9. Provide special right to women, dalit and youth. 10. Struggle for sound trading of education and health. 11. Implement revolutionary land-reform to maintain landless, homeless and Kamaiyas (who are confined into bonded labour). 12. Indoctrinate the workers, dalits, peasants, nationalities and women with correct political-ideological policy and programme. 13. Consolidate the party into vanguard of proletarian class and revolutionary party. 14. Struggle against price-hike, corruption and insecurity. 16. Accomplish the Nepalese revolution by making the transition period short for building People’s Republic. 17. And, at least, transfer the state power from the hand of bourgeois into the hand of Revolutionary United Front of patriots, republicans and leftists. 18. The above mentioned tasks are the task to be fulfilled by the proletarian class and Nepalese people in the present context. This task cannot be a simple task because the future of Nepal and Nepalese people lies on it. This task and responsibility should be handled and led without delay. For that, we should make the revolution success. Nepalese proletarian vanguard has got extraordinary task to fulfill. The task is to be fulfilled in the period of in the intense struggle of revolution and counter-revolution. Is it possible? Principally, it is true that the complexities and the knots of the political struggle and class struggle can be untied by the revolutionary & scientific proletarian class and its vanguard. This has been justified in practice. When the proletarian class is unified with the labourious people, people get their leadership and proletarian class, as the leader, removes the obstacles, dilema and un-decision making. 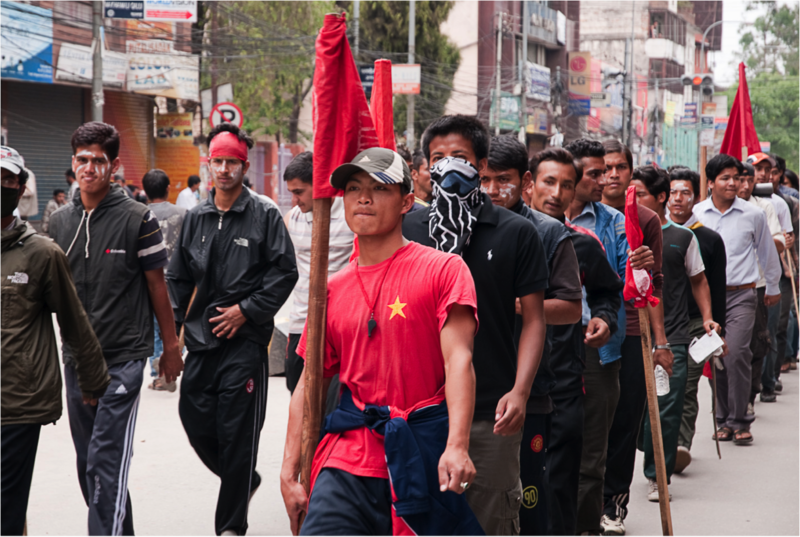 So far as the context of Nepal is concerned, UCPN-Maoist is the most conscious, organized and warrior class. In course of 15 year class struggle and political struggle, unprecedented victories and successes have been established and organized. Building of People’s Power, Constituent Assembly and the establishment of republic have been possible due to this proletarian class and revolutionary party. Therefore, the accomplishment of the incomplete task is not out of the reach of proletarian class and UCPN-Maoist. The possibility for peace and change by leading the political situation ahead is only by the proletarian class and its friend forces and UCPN-Maoist. As we have already explained that the parliamentary forces are breaching the mandate, agreement, understanding and abusing the state power against people. The anti-people forces have repeatedly recited the words “democracy”, ‘peace’, ‘parliament’ and others for spreading illusions among the people. This class has inner intention to labialize UCPN-Maoist as it was in the war period. This class has continuously attacked over our party, our ideology, leadership, plan and programme. It is making its effort not to give any chance to UCPN-Maoist and laborious people at any cost. Its effort shows that the state power would remain in its hand and it would not go into the hand of proletarian class or UCPN-Maoist even by mistake. However, the political situation of the country shows that it will be the foolish activity of parliamentary philistines. As UCPN-Maoist got victory in Constituent Assembly as the largest party, the treacherous activities and the violation of the agreements and understandings by the parliamentary forces have made the condition of the people and the nation more critical and full of suffering. This clearly shows the transformation of parliamentary forcers into regressive forces. Parliamentary forces like Nepali Congress and UML are without vision and agendas. They have no other than the agendas put forwarded by UCPN-Maoist and they are very weak and displaced basically. This shows that the parliamentary-regressive forces have reached near to their defeat though they are trying to give illusions to the public. 1. It has correct ideology: Marxism-Leninism-Maoism. 2. It has unavoidable proposals related to politics, economy, social, education, health and employment. 3. It has consolidated and established leadership. 4. It has more than 4 million voters and more than 10 million supporters and well-wishers in the country. 5. It has more than 10 thousand whole-timer cadres. 6. Its agendas are well established and even Nepal Army, administrators and bureaucrats are influenced by them. 7. It has patriots, republicans and leftists around it to form united front. 8. It has developed its independent and balanced international diplomatic relationship. We can confidently say that this relationship will help to accomplish the left-task of revolution. The question of state power is still left to be solved in the central level though UCPN-Maoist has solved the question of local people’s power in the process of People’s War. Specially, the process of solving the question of people’s central power has been postponed since after the agreement and co-operation with parliamentary parties for the implementation of common tactics of republic. However, the transformation of the central state power has been stopped due the abuse of power after the stronghold of parliamentary parties like NC and UML because they are abusing it to stop peace and advancement. This has brought the struggle between revolution and counter-revolution on the surface. It is impossible for the proletarian class to hand over all the unprecedented devotion, sacrifice and dedication on the feet of the bourgeoisie. And at the same time, it is not possible for proletarian class to go back without changing and transferring the characteristics of the state power from bourgeois to proletarian, as Marx says, making people owner of the state power establishing in place of bourgeois. This entry was posted on May 15, 2010 at 1:37 pm	and is filed under Nepal News. You can follow any responses to this entry through the RSS 2.0 feed. You can leave a response, or trackback from your own site. The current situation in Nepal, as outlined in this and other recent reports, is deeply complex and hard to interpret accurately. Even the guiding mission and objective of the revolutionary movement is now not so clear, at the very moment when a strong clarity of intent is most needed. It seems that a deciding moment in the struggle had come to a powerful climax, but now that moment has at least partly lost its focus. It must be difficult to maintain full morale and pressure in a proletarian uprising if there are delays in the climax, and evidently the forces of reaction can play for time in order to dissipate the force of the revolutionary moment. To press into a final showdown requires exact calculation, but it may also require dramatic all-out courage. The many factors in play at the moment must be very challenging to see clearly and wisely, but in one sense the situation is blindingly direct: either the moment is decisively seized, or it slides dangerously into a lapsed state, which may mean that a great deal of revolutionary momentum is irretrievably lost. To argue for the assimilation of two opposed armies into a merged formation seems hopelessly compromised. Maybe it will take some kind of pitched battle to take this stalemate back to crisis point and towards a decisive outcome. From the outside, we can do little but hold our breath and try not to be self-righteously back-seat drivers. How is your little comment not precisely that? You have a whole embedded set of verdicts laid out — negative and judgmental. And then end with that sentence? Do you have any sense of revolutionary history? I just spent a day reading the fine print of the summer of 1917 — where the bolshevik spokespeople declared (over and over) they did not intend to stage a new uprising and were not making military preparations. When they launched their forays (april then july) and discuvered they weren’t strong enough to unseat the government — they withdrew and even disavowed leadership of the attempts. What does “clarity” mean for you? Public statements of intent in front of an endangered government? to be blunt because it needs to be said: It seems to me this line of thinking is deeply anti-historical and infantile. And if you think you are not being a backseat driver you need to re-read your own comments. 2) the essense of class struggle is “one eats up the other” — every great revoluitonary movement has integrated large parts of the enemy’s army into their forces. Does anyone read history? 3) the maoists are facing a stronger and still undefeated army — and are politically trying to weaken and split it (especially split the democratic rank and file forces from the corrupt upper class high command). 4) they are projecting to the military that if they come over they have a future in the new society. 5) their vision of “integration” is a restructing of the country’s armed forces under the leadership of a new Maoist-led order. 6) There are people who think that when political forces make demands that this means they think this is possible. I don’t understand what planet such thinking emerges form. Political forces often make demands (based on the mass line and based on their goals) that they know are impossible. Please climb out of your sandbox. What exactly the Maoists believe and expect in this situation is not clear — and i suspect they don’t have a clear unity on it, and much of ut depends on what the miitary forces do in crisis. Nando’s first post (above) dismisses my comment as infantile (thanks for his calmness), for apparent lack of clarity as of now in current revolutionary aims, but then in his second post (also above) he asserts a very similar lack of clarity. My own viewpoint is certainly not negative and judgemental (stay calm), but anxious about prospects made hard to read because of current unclarity. Of course “much … depends on what the military forces do in crisis”, who would ever doubt that.